Great looking project! The finishes are looking amazing on the sample parts. One question, I looked at your S3D profile, you aren't using relative extrusion? Any reason why you don't use it? very nice. I wish your design had been done before i build my corexy. how does it compare to your blv AM8? @blv Looks like a great printer! One question though: in the BOM you list high temp magnets. How and where do you attach them? The best option to my opinion: stick high temp 12 magnets with 3M adhesive (in the BOM i gave a link for the magnets and sticker in one place) in on top of them the Bed insulation. Honestly, both are good although the moving bed was a bit less optimal for bigger prints. If that image had been there yesterday already I must have missed it. On my setup I am also thinking about going for magnet build surface and also dislike the magnetic sheets. Since I do have a separate aluminium plate (5mm) and silicone heater pad, sticking the magnets even onto the silicone heater pad will leave me with barely any forces on the top side. I can stick them all around the silicone heater pad but that would only provide me magnetic forces on the edges of the spring steel sheet. Only way around that is to sink the magnets into the aluminium plate either from top or the bottom but I am not really looking forward to do this. The timing on this, I've been thinking about going to a XYCore style printer to eliminate the massive moving bed back and forth! And it's from the same guy as the AM8.. Couldn't be any better! I like the way that it's open at the front, like the E3D tool changer. @Blv I'm impressed with your documentation, Great Job. I'm looking to build a corexy in the next few months and stumbled across this on thingiverse and am interested. 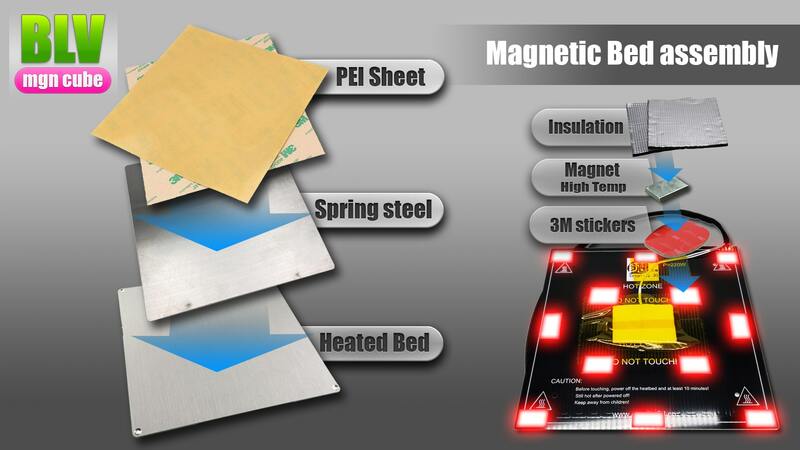 I wanted to point out for the magnetic heated bed, Aliexpress has a 300 watt 300x300 heated bed with the magnets already attached and it comes with a spring steel top. I have one on order to try on my Taz 6 printer and figured you may be interested. Great respect to your work! Your doku is really good and you have really put in a lot of time - no children and no woman at home? I like your belt guide and the belt tensioner! Which sense has the deflection at the corners? PS: Today I have ordered the hardened replacement balls for the MGN12 - suuuuper tip! Thank you, you will be surprise to know that i do have wife and small children..
Queria modificar alguns arquivos, você consegue disponibilizar os arquivos 3D dos itens ?? o que você disponibilizou não consigo ter acesso as pecas. Translate: I wanted to modify some files, can you make the 3D files available for the items ?? What you have made available can not access the parts. Do you mean CAD files? @phaedrux isso mesmo, os arquivos CAD de todos os itens para que eu possa editar. isso mesmo, os arquivos CAD de todos os itens para que eu possa editar. Ave you looked at the thingiverse link? It looks like a lot of the step files are there..
@phaedrux estão apenas os arquivos STL e esse tipo de arquivo eu não consigo alterar. 98% of the project step files can be found there.